Creare have analysed the search results of 1,172 local keywords. The results reviewed 7,470 unique websites and 40,955 search results. This gave us an insight into the type of results being shown, the software used and how often popular ranking factors appeared. Kieran Headley (Creare’s SEO Systems Guy) has been tracking our clients’ keyword positions for years and we’ve finally got round to putting all our data to big use. To explain the experiment we picked some typical SME related keywords in a selection of local towns and tracked the results only with Geotargeted keyword placement i.e search query ‘Plumber’ location set to ‘Rugby’. Total keywords checked 1,172 daily, data set averaged over a week. What percentage of results had a micoformatted address? We checkedÂ for schemaÂ local businessÂ markup in the results appearing for our local keyword searches. Why? Well in most articles surrounding good practice local SEO, schema or similar microformatting is suggested. The idea being you can say “Hey Google, we have an office here and we’re a local business…’ and in theory Google rewards you for this selfless act. Interestingly, and to my surprise, a much lower number than expected. We’ve been adding a schema marked up address to our local clients for over a year convinced it has a positive effect. Maybe it does and we’re ahead of the game – that’s what I’m going with. 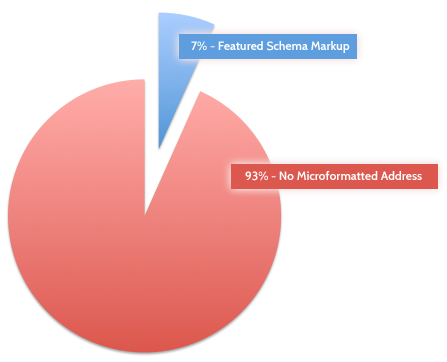 What percentage of results hadÂ review microformatting? We also checked whether the sites in the results featured any review schema. We checked this knowing reviews on local business pages and review sites can help improve the quality of links and citations. We wondered, if you tell Google “We’re great! Look at our reviews”, does it help your positions? 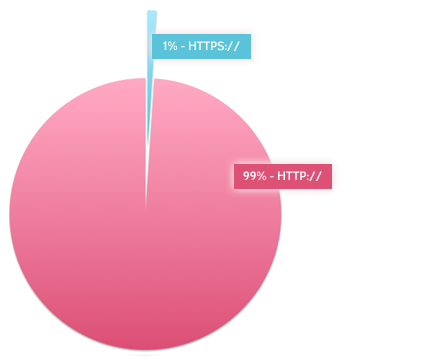 Does having a secure website improve your ranking? Google recently made the point that if your site is secure, they’ll make sure it ranks better, check out the official statement here. We thought this would be a simple but relevant variable to check. Not a convincing result, however Google is probably in the early days of refinement. I also think this applies more to sites that take payment online. 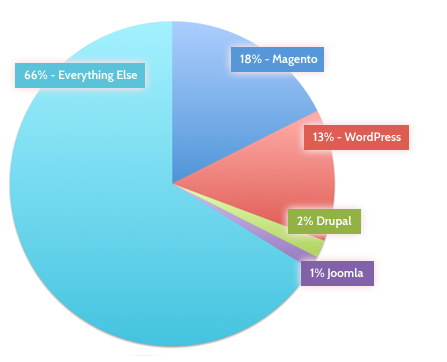 What’s the most popular CMS or Software? We tend to build sites in one of two ways, either in Magento (for eCommerce) or WordPress (CMS). Both make claims about their platforms being SEO-friendly, so we wanted to check for ourselves. A really interesting result for this one, again surprising us. We expected WordPress to feature highly as we know the platform is an industry leader, however we primarily use Magento for eCommerce website development. Does this mean eCommerce websites are performing for local search results or are people using the Magento platform to maximise their local exposure? Hopefully you found some of the data above useful. We have gathered so much it’s difficult to know what to extract! If anyone has any suggestions we have the ability to track and dissect 1000s of searches, keywords or websites daily, so leave your ideas in the comments and I’ll see what I can do.